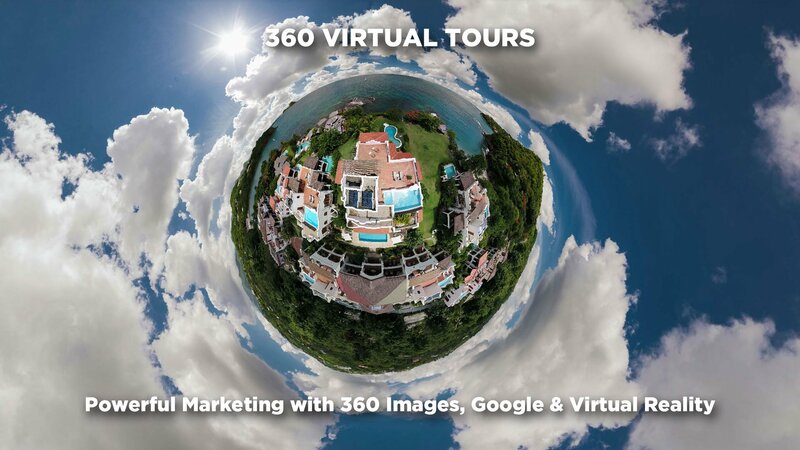 Virtual tours are powerful marketing tools especially for hospitality and multifamily. The technology keeps getting better and better. We have created a strong new approach to make virtual tours even more effective by creating 3 assets from one shoot. All of this with a super easy user experience and major value. These virtual tours start with the capturing of your space with our professional 8K resolution 360 camera then post processing to make the images pop. These virtual tour images are way higher resolution than a Matterport tour and also much higher than most off the shelf 360 cameras. For an example of this powerful 3 for 1 virtual tour example I have chosen Cap Maison in St. Lucia as a case study with examples of all that can come from the captured virtual tour assets. First of all, we create is a virtual tour walk through (aka “street view”) that we as a Google trusted partner can load directly to Google Maps. Google Maps does not allow “marketing” embedded in these virtual tours but we will address that in Asset 2. Google will display these tours in the map in 4K resolution but yours will look better than most because they will be captured at 8K which will “up” your quality even though they limit the display resolution. These virtual tours of your property will be available directly in the Google infrastructure (Maps/Search/etc.). We’ve written a ton about that in detail which you can read here. The Google virtual tours of your property can be as in depth as you want them to be. In this example from Cap Maison below it is possible to walk through out their entire amazing property and in and out of the different room types. This context coming straight from the Google Map is serious booking power. Secondly, you could simply take the Google virtual tours and embed them into your website, however there is a better way. We take the same imagery at the higher 8K quality and build you an interactive tour. This tour can include embedded marketing assets like videos, menus, photos, audio — whatever you desire. Below you can see the entire suite of virtual tours from Cap Maison. Each of them have some deeper contextual media inside them to make them interactive and fun. For example, you can jump from the drone view down into a room type of your choice with a single click which you can try below. Lastly, This asset is future proofing your brand as virtual reality becomes more and more mainstream. We take these same images and created a virtual tour of the exact same spaces as above. With a simple link you can access these tours in any headset simply by clicking the link. If you have a headset and would like to try it — click here for one of Cap Maison’s virtual reality virtual tours. They are really cool! We would love to help you design a virtual tour package. One great thing to note is that these virtual tours are white labeled. You can use with your branding and have no server fees associated. Contact us for more info about virtual tours.